I rarely pay to sit in business or first class. At 5ft 9in, I am a decent fit in economy class seats with a little extra legroom. That doesn't mean that I don't love a good experience up front, which I take via upgrade or use of miles when the stars align. 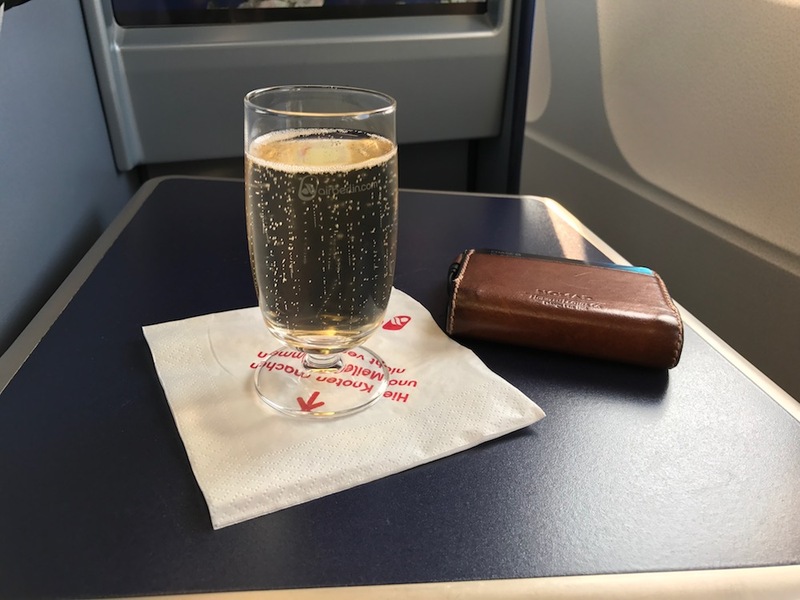 My recent flight in AirBerlin business class from Berlin to New York was one such moment, and it was quite good. I've written previously about AirBerlin's OK economy service within the EU. Their business class experience is lightyears apart. This was a fun post to write for its rare opportunity to bring together my geeky love of wine and commercial aviation in a single piece for, yes, I have tasting notes below! I booked my entire Sweden to U.S. (GOT - DCA) flight on a single ticket through American Airlines. 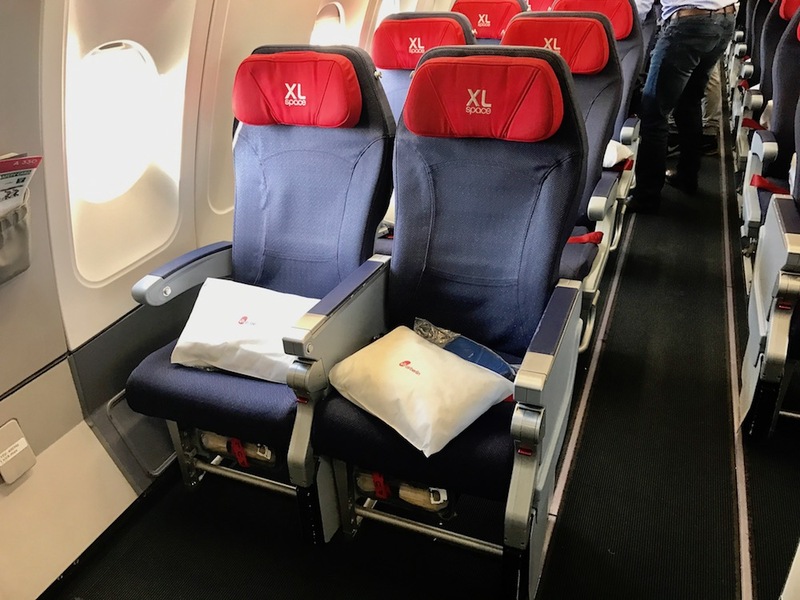 This gave me flights on AirBerlin from GOT to TXL and TXL to JFK (including this one in business class), as well as first class on a commuter jet from JFK to my home airport DCA. The entire thing ran me 60,000 AAdvantage miles. It would have put me out somewhere in the $3,900 range in real dollars (yikes!). This was the second leg of my aforementioned AirBerlin trip from Gothenburg, Sweden to New York, so I arrived at TXL having already flown the airline that day. It's worth noting that my experience at TXL was complicated somewhat by the bizarre way I arrived there… the A gate that I flew into emptied nearly directly into the ticketing area and ground transport pickup / drop-off hall. Anyone familiar with Kansas City's MCI airport will know what I'm talking about. There wasn't even a gate agent to ask for directions, so the result was that I quickly found myself on the pre-security side with a carry-on suitcase containing booze (Akvavit) that I had purchased at the duty free shop in Sweden, and an immediate need to quickly change terminals from A to C in order to make my trans-Atlantic flight. Alcohol purchased duty free at a previous stop may go through the security screening in carry-on luggage provided that it is still in that sealed duty free bag. This was my experience at both TXL and JFK, though the American TSA crew was a bit rougher with it as they cut up the bag and then resealed it with what seemed like an entire role of institutional tape. I cannot underscore the importance of not opening up the sealed bag, lest you really foul up your comings and goings through security. Tegel is sufficiently big enough that your arrival from another EU / Schengen country may very well not be co-located in the same terminal as your departure out of both (i.e. to the US). This is worth the note because travelers on AirBerlin may very well find themselves routed through TXL. TXL itself is not a beautiful airport. I passed some attractive lunch options on the way, but don’t expect the grandeur of international flights at, say Madrid Barajas, or the well kept intimacy of pretty much anything going through, say, the airports in Gothenburg or Lisbon. It is (or at least, the part I toured) basically a gussied up warehouse with planes. On that note, the international departures gate C88 was not much of a gate. Rather, it was a ground level pass through to a bus, which surprised me given we were about to hop on a wide bodied jet for a trans-Atlantic flight. Business class and travelers with OneWorld status get to board the first completely not-crowded bus, which is a nice perk if you can call it that. The upshot of this was a pretty cool experience to board a big plane outside from the tarmac. Beautiful day, so I was into it. I'd have been cranky in the rain. Once aboard, I was directed to my seat by a very nice flight attendant who goes by Sam. She was helpful during the boarding process without being overbearing, as we were all left alone to settle ourselves and load our carry on bags into the ample overhead space. My Tumi Alpha 2 International 4-wheel Spinner Carry-On fit just fine at the standard 22x14x9 inches, akvavit and all! It's important to remember that AirBerlin is still a low cost carrier when assessing the interior, even the business class interior. It doesn't shine and sparkle the way that some particularly newer premium cabin products do, but it was very good in a way that I'd describe as "function over form". The business class seats are arranged in a 1-2-1 window to window format, i.e. in each row there is one seat at the window, another two across the aisle, and then another single seat across the second aisle at the window on the other side. All seats have direct aisle access, meaning that no passenger up front has to climb over another passenger to get to the aisle. I cannot say how important this is when you're working with lie flat beds. The truly great product are the window seats of rows 2 and 4, so seats 2A / 2K and 4A / 4K. The placement of the seat equipment in rows 1 and 3 results in these row 2 and 4 seats being some of the most private airplane seats I've ever flown in, with a full three windows all to yourself. Do whatever you have to do to reserve these at booking. Center seats in rows 1, 3, and 5 are attractive options when traveling with someone you know and like. 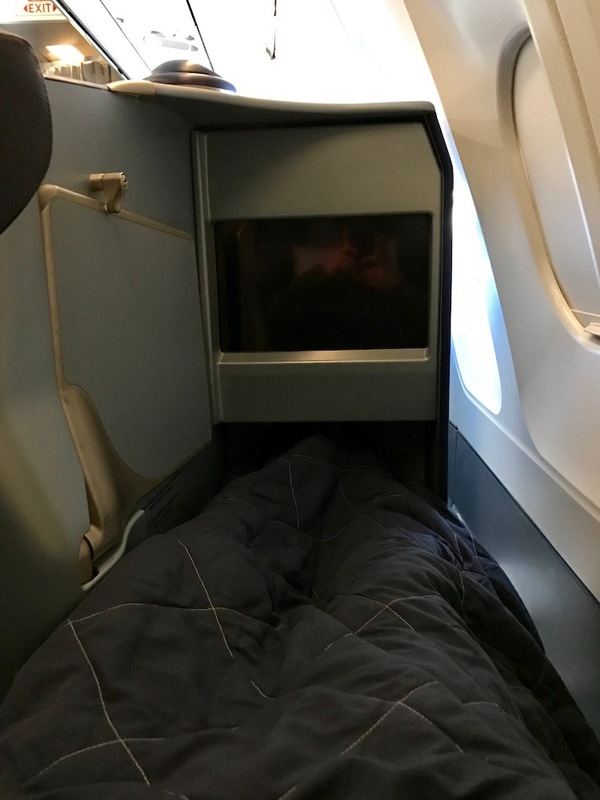 A similar phenomenon as the aforementioned semi-private window seats plays out in these three rows to create little two-person suites; great for someone you really want to spend time with, awkward for strangers or business colleagues. The remaining seats are all pretty much the same single person, aisle access (not a lot of privacy), little or no window action, but still comfortable business class seats. I'll note here that I think my seat, 4K, was truly exceptional because it is directly in front of the crew rest seat such that the curtain from crew rest pulls around to give 4K even more privacy than the others. Nice! The hard product, i.e. the seats themselves, is solid. Each comes equipped with a private TV screen that I'd estimate at 15-17 inches, an ottoman-like pedestal for your feet with a little cubby underneath to store your shoes, cup holder for a bottle of water already placed on your arrival (I recommend you use this for your wine glass, just to be safe), good-sized tray table, adjustable lumbar support with a massage function, and controls that allow you to move your seat forward for eating or working at the tray table, and backwards as part of the action that turns the seat into a lie flat bad. It's an exceptional product in seats 2A / 2K and 4A / 4K, and a solid product elsewhere. My only complaint is that the "lie flat" bed is more of a "like flat and bend your knees" bed if your over about 5ft 9in (me!). My only complaint about the interior configuration relates to the business class lavatory (bathroom). It is located directly within the galley (kitchen), meaning you have to make a nuisance of yourself to get to it (the crew is very gracious in their accommodation of this), and it is located smack next to food preparation. Second, there's only one, which seems insufficient for twenty passengers plus crew. Speaking of crew… As you'd expect on an international flight in this class of service, the crew was 100% friendly, attentive, and able to communicate with fully fluently in both German and English (and I'd imagine in a few others too, were I to have had the skills to try). The captain was minimally intrusive, though hard to truly evaluate because the public address speaker was a bit too quiet for me to hear him well. I do sometimes wonder if the crew members serving business or first class are truly as nice people as they come across, but I am going to go with "hope so" because I like to believe the best. Oh my. 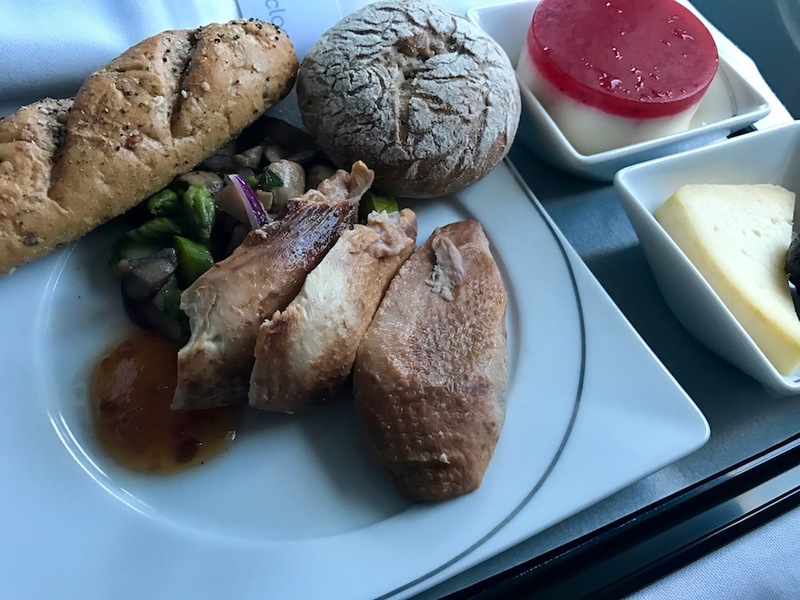 If you're used to economy class, or to domestic first class in the United States, the food up here will blow you away. You'll start with an offering of orange juice or champagne (I'll let you guess which I chose) soon as you've gotten settled post-boarding. Many airlines have partnered with known high end restaurants and chefs to prepare menus the last several years, and AirBerlin's restaurant of choice is Sansibar on the North Sea. Be prepared very early in the flight to order your first beverage, and then a short time later to order your preferred appetizer and main course. The menu in both German and English is your friend here. Salmon is the only fish that I'll eat cold. I had a feeling about this one (perhaps because it was "Nordic", harkening back to my ancestors and the place from which I had just come the day before). It was fantastic, tender and smooth with the perfect spicing. It was a nice pair with the tasty potato salad served in just the right quantity. The sesame white bun was fine, but the warm brow bread was quite good. All served with a small yet actually legitimate salad. I was really in the mood for fish, and the main course cod with lentils was fantastic. Actually, the lentils and the carrots were just as good as the cod, which is rare in my book. This dish was on par with many-a-restaurant I've enjoyed. Just right. Light colored with a pleasing semi-mild nose of melon and a little mango, this refreshing blend of Chenin Blanc and Sauvignon Blanc was predictably a bit grassy turning drier in the palate, though well balanced. It was happily not as brutally grassy and dry as some similar blends can tend to be, tempered by a bit of a tropical fruit medley all played as a very nice compliment to both fish dishes. Finally, the dessert course came in the form of a cappuccino mascarpone tart that was very light thanks to the latter with just a hint of the former. Fluffy, like a cloud in your mouth, it was really nice after such a good meal. There was a rosé wine option that I enjoyed a sip of, but did not think would suit the food as well, along with several other red and white options. I opted for a Rioja (red) for the rest of the journey. This blend of 95% Tempranillo and 5% Graciano was served chilled, so the nose was a bit suppressed. Sam, our very nice flight attendant, raved about it. Distinctly purple color in the glass it is less red than it is outright purple. Nose is a little bramble fruit and plum, little hint of smoky wood, like a smoldering fire. Chilled temperature heavily influenced the palate via the mouthfeel, creating a cooler sensation of dark fruit that went down easily, very little acidity, and tended to not feature some of the drier tannins common in Riojas served at room temperature. Some of the best airplane wine I’ve had. I slept for several hours and awoke around Canada to a cold pre-arrival meal. It was tasty, but not on par with the others. I stuck with the Rioja, and really enjoyed myself. Each seat was stocked with a substantive pillow and blanket, as well as an amenity kit "Wunderkind by Wolfgang Joop". I've heard that the kit bags were previously supplied by Tumi, which I would have preferred, but I'll not quibble with the sleep mask, ear plugs, lotion, tooth brush and paste, and chap stick. Small and pithy, but that chap stick was a life saver on a dry flight early in the time of year when we're just starting to think about carrying our own. The bag it all came in will be good for something I am sure. 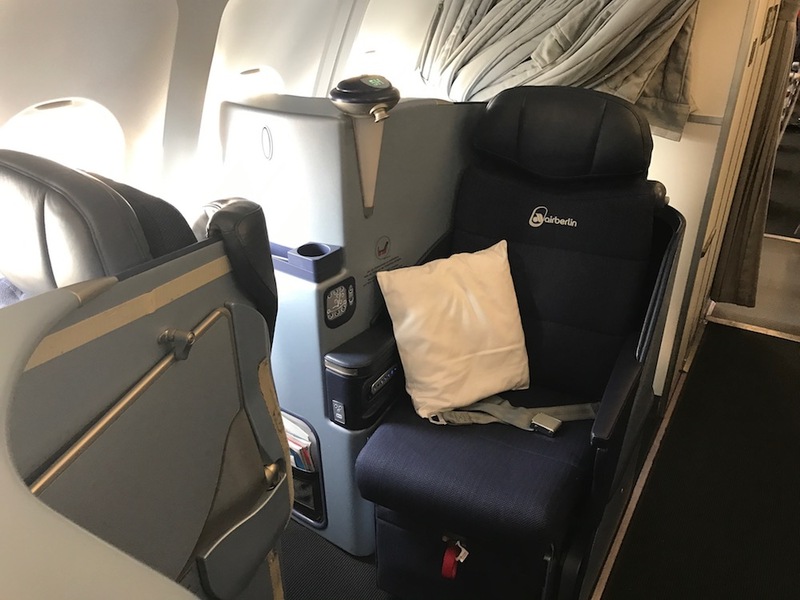 Bottom line here is that AirBerlin has put together a very compelling, comfortable, and delicious business class offering to up the ante from its economy product. This is an industry trend: Economy is getting more cramped and less fun, while premium cabins are in an arms race. 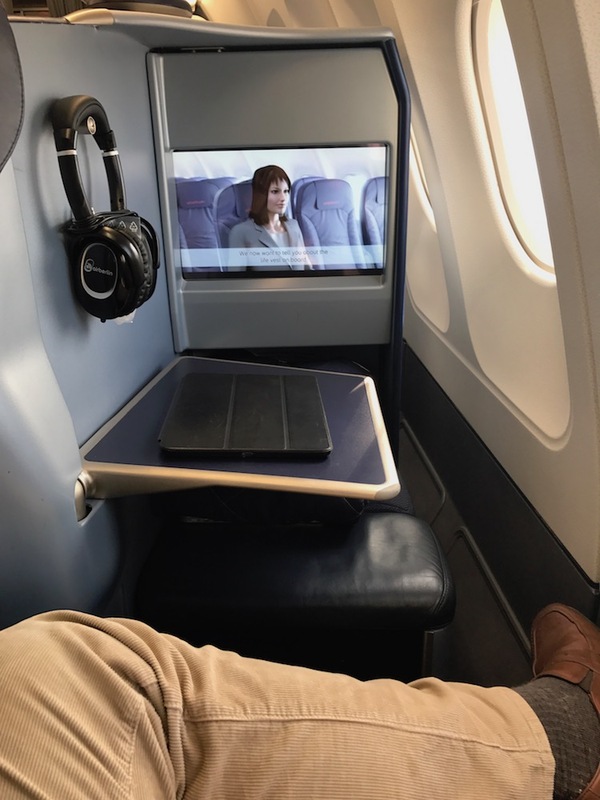 The price of these types of flying experience are out of reach for a lot of travelers, but they certainly are fun on special occasions when you're laying down points or miles to take them.